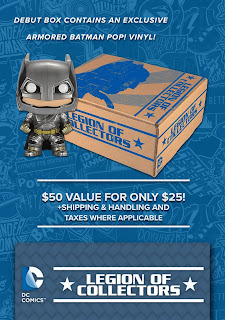 Legion's DC LEGACY box pushes the boundaries of Funko cool. We were mightily impressed with January's DC LEGACY, a sub box that pushed the boundaries and shook off some dust that had accumulated on Funko's business plan. And even though our box arrived damaged, March 2017's arrival takes a slight step sideways with SUPERMAN, celebrating the classic character with a collection of great products that once again stretch the genre into exciting new territory. 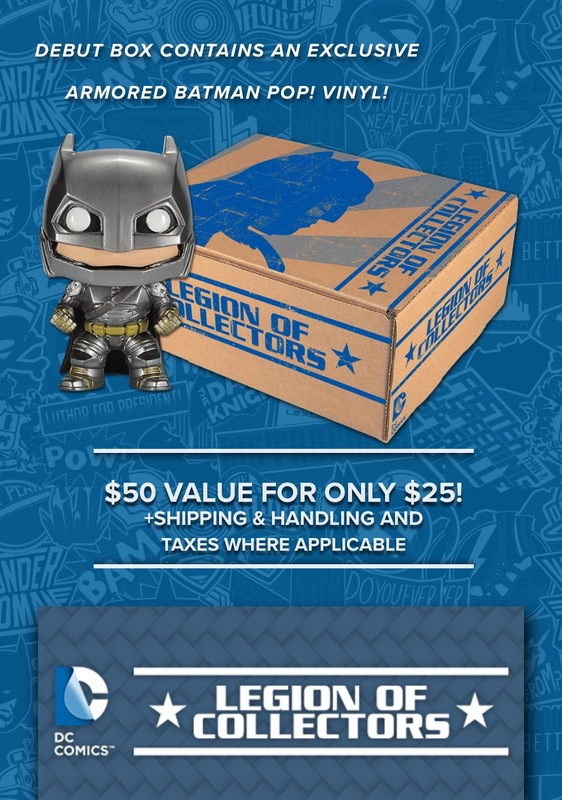 Before we begin, let's look at the deal again: promising a value of $50, the sub continues the tradition of Funko partnering each time to deliver an exclusive figure and t-shirt without the fluff or filter (their words). Joining at the VIGILANTE MEMBERSHIP, members receive 6 boxes every year, with the promise of an exclusive themed collectible gift on the one-year anniversary of your annual membership pf $150 p sh/h. You can also subscribe at the SIDEKICK LEVEL at $25 with $6.95 shipping. That's literally the same deal as Marvel Collector Corps. DC/Funko promises a similar one-year anniversary item with VIGILANTE, but with the spectacular failure behind Marvel Collector Corps' Golden Cap figure, I'm not hopeful for a cool reveal. We were not happy at all to see that our box arrived crushed in several key spots, and worried that the damaged had seeped into the contents. Sadly as you can see, the Funko box arrived pretty torched. In our three-plus years of writing, this is the first box to arrive in such condition, so we'll write it off to our postal system testing whether Superman can really fly. The size of the box is fairly standard, but reveals one interesting level after another, starting with a pin/patch set. It's a critical opening swing each time a box arrives, but not always indicative of successes under the cardboard covering. But for now, let's revel in a very nice set of classic-looking Supes. The stitching on the patch is good, while the light-blue suit on the pin is great. I know last time I mentioned that a standard box like this one can have its issues, but as you see from my pictures, things remain high quality and retro cool. WIN and WIN. The Superman Funko comic is as an awesome as they get, showing off The Last Son of Krypton as we remember him growing up. DC's #1 never looked so good, and the colors once again pop with an almost 3D feel. Yes! You can't have a DC box without highlighting one of your #1 heroes, and the comic does him more than justice. A solid WIN. There is so to like about this Classic Superman that it's hard to contain my enthusiasm over it. Let's start with the sculpt, which features a killer set of ab muscles and that lock of black hair. So Supes. The coloring of his uniform is also fabulous, with it leaning a tad darker than I would have expected. But at least we're not talking baby blue! I'm really impressed with Funko's command of its sculpts; granted, you don't have to do much to make Superman a winner (as he has no utility belt or overly detailed suit). But there's something cool when you see them get the spirit of a hero so completely, and I find myself loving this as much as I loved their first Armor Bats that appeared when the box first began. WIN. So, here's the deal Funko: 3/4-scale figures are just fine. We got a decent Diana from you a few months back (and that jet! ), but 3/4" is for children, and I don't think that's who collecting these boxes. As a loving Marvel Legends 6" collector, please consider offering a bigger (and therefore better) figure than one that's poseable in so few places. Granted, we love the once-used symbol - and the card is super cool - but he looks a tad...well... Bizarro. And that's OK, considering this is taken from a 1938 version of Superman, but perhaps Funko will surprise us one day with a gorgeous Funko 6". Wouldn't that be great? For now, consider this a WIN so long as you know what you're getting. Love. This. Shirt. Sort Of. When we pulled this one from its plastic prison, the softness of the material really caught us. This one is wearable right now, even though I know some of you love to wear a shirt right from the rack, complete with all of those chemical all over it. But there's more going on here with this one, including the awesome backdrop of The Daily Planet and logo that takes me back to Super Friends. But there's an issue: the size. While all Funko shirts do fit a tad differently, this XL looks more like a XXL. Either that, or it's what my Nordstrom shirts sometime refer to as "generously cut." I have another SF shirt that suffers from the same problem, and it's frankly a problem to wear. I love so much about this shirt that I hope a couple of washings relieve my concern, so for now count this one as a WIN. It's never a good thing when you think that these boxes are throwing in something lame just to fill the empty spaces. At least Funko's keychain of a flying Superman is nicely made and certainly worthy of protecting your keys from local thieves. It's beautifully colored and not too big for your pocket. I just wonder how long the gorgeous paint will keep before we see nicks and other marks seep in. Say what you want about the company's choices and whether a keychain and action figure are excellent ways for Funko to extend their brand, but when they're well made and aren't a hat or cup I can't drink from, count this as a WIN. DC's Legion of Collectors SUPERMAN box is a great celebration of this iconic character. Sporting a great shirt, an excellent figure, and several other nice ancillary toys, it reminds us why he's the Sentient Power (thanks so much Smallville's Dr. Fate for that gem). I've written for awhile about whether these boxes can survive long-term, and it all goes back to quality. Should Funko continue to deliver boxes like these and January's LEGACY, we won't have a problem supporting them. I wrote last time what this box had a lot to prove because LEGACY was so inventive. Not every box needs to be so, and my concern has always been about quality and timing. Attaching SUPERMAN to those standards results in a box that's just as good as LEGACY because it hits all the marks. And with our next box featuring WONDER WOMAN (as we get ready for the November movie), I will be looking for it to soar to similar heights. This box comes HIGHLY RECOMMENDED.